Makes exterior walls and roofing a meter wide to any length. 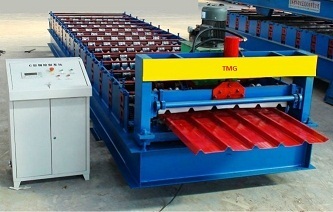 Exterior cladding, main forming machine with hydraulic cutting and systems, product stand, and electrical system. A computer operated truss, partition wall, stud, & track structural machine. This roll forming machine consists of an uncoiler device, coil sheet guiding, main roll forming system, cutting device, hydraulic station, and PLC control system and support table. Steel stud and paneling equipment. This equipment makes K SPAN structures with precision in a timely manner. FRAMECAD F300i/315i Steel Stud and Paneling Equipment- With the input of the design, each piece is made to specifications and labeled for identification.